Grab your Friends and Go Finding, at HomeGoods. Find inspiring décor, top brand furniture, gourmet cookware, designer bedding, plus everything from unexpected global finds to everyday essentials in storage, rugs, specialty foods, bath, kids, pet & more— all for less than you expected! 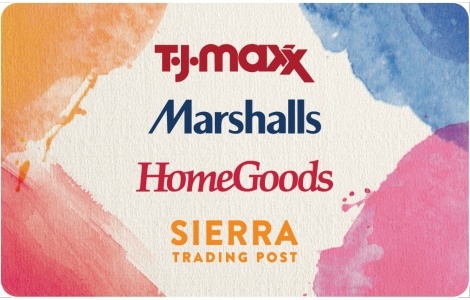 The TJX gift card is redeemable at over 2800 HomeGoods, T.J.Maxx, Marshalls, and Sierra stores (in the U.S. and Puerto Rico) and online at tjmaxx.com and sierra.com. National Gift Card is the best place for you to order HomeGoods gift cards in bulk. We are the experts in all things gift cards and can set up your gift card solutions program for you today. Please contact us for more information on HomeGoods bulk, direct-to-recipient, or individual gift card fulfillment for your gift card program. Contact us here or call us at 888-472-8747 today! For balance inquiry, please check your most recent receipt, visit tjmaxx.com or sierratradingpost.com, or bring your card to any T.J.Maxx®, Marshalls®, HomeGoods®, or Sierra Trading Post® store and an Associate will be happy to provide you with your balance. Use of this card constitutes acceptance of the following terms. Cards cannot be redeemed until activated. Purchases with the card will be deducted from the balance until it reaches $0.00. The card is redeemable for merchandise only at T.J.Maxx, Marshalls, HomeGoods, and Sierra Trading Post stores (in the U.S. and Puerto Rico) and online at tjmaxx.com and sierratradingpost.com and cannot be redeemed for cash except where required by applicable law. If lost or stolen, it will not be replaced. This card has no expiration date and incurs no dormancy fees. Any term is void where prohibited by law. This card is issued by and represents an obligation of TJX Incentive Sales, Inc., a Virginia corporation.